Brenda was recently diagnosed with breast cancer. 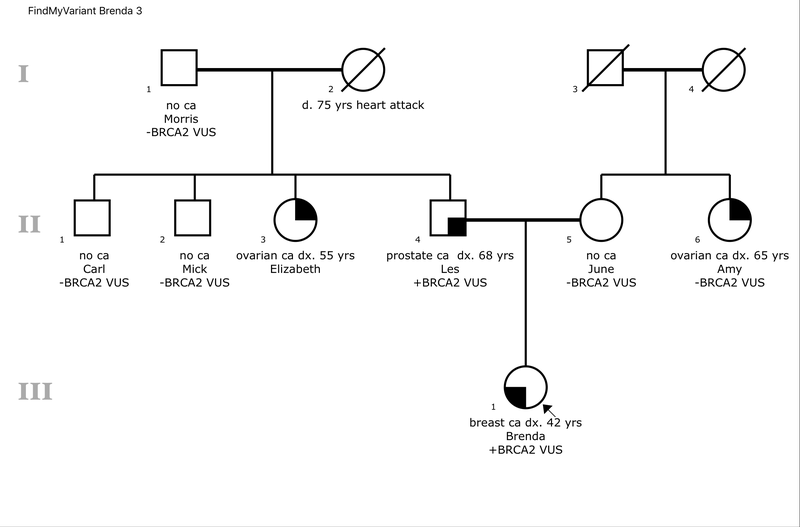 She got genetic testing and was found to have a VUS in the BRCA2 gene. Brenda’s report said that the VUS was not predicted to cause damage to the BRCA2 protein, and that it was common in people of European ancestry. However, there was not enough information to say whether it caused an increased risk of cancer. Brenda wanted to know if the VUS had caused cancer in some of her family members. She had two aunts who were on opposite sides of the family who each had ovarian cancer. Brenda decided to reach out to her parents, Les and June, first to figure out which side of the family the VUS was coming from. It turned out that Les had the VUS, which meant Brenda inherited the VUS from her father. This was interesting because Les had prostate cancer in his 60s, which could be associated with the BRCA2 gene. Brenda’s mother June did not have the variant, which meant that Brenda’s maternal aunt Amy, who had ovarian cancer in her 60s, also did not have the variant. Since the VUS came from her father’s side, it might have caused the ovarian cancer in Elizabeth, Brenda’s paternal aunt, who had ovarian cancer in her 50s. Unfortunately, Elizabeth had already passed away, and did not have children. Brenda asked her living paternal uncles Mick and Carl to get tested. She also asked her 87-year-old grandfather, Morris, to be tested. Uncle Mick and Uncle Carl did not have the VUS, neither did her grandfather Morris. These results provided some information. The variant came from her paternal grandmother, who died at 75 of a heart attack. Now the key to classifying the VUS would be figuring out whether Aunt Elizabeth had it. Brenda found out that some labs might be able to test Aunt Elizabeth’s ovarian tumor sample for the VUS, if Brenda could figure out a way to get the sample to them. Brenda decided to ask her father, who was Aunt Elizabeth’s next-of-kin, to call the hospital where Aunt Elizabeth got surgery to remove the ovarian cancer. Fortunately, the hospital still had some leftover tumor sample. Hospitals usually keep tumor samples for at least 10 years. After the VUS testing lab requested the tissue and Les signed a form, the hospital sent a tumor sample to the lab so that the lab could test the tumor for the VUS as part of Brenda’s clinical care. 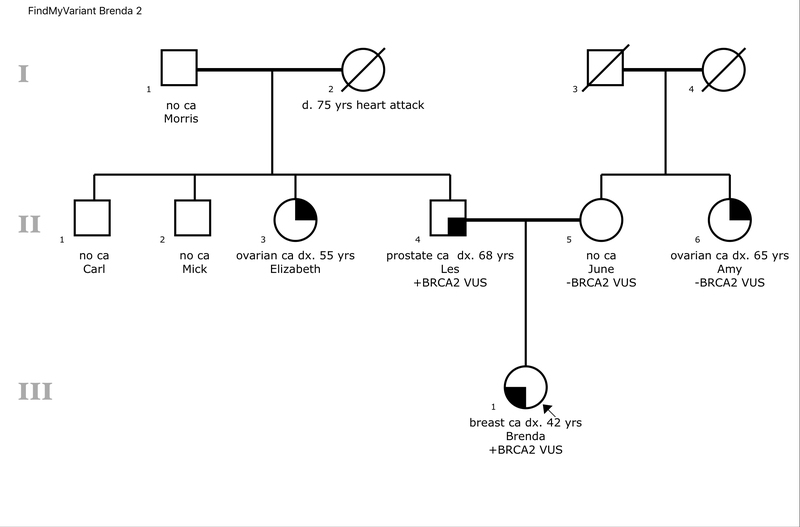 The tumor testing showed that Aunt Elizabeth’s ovarian tumor did not have the BRCA2 VUS. This meant that it could not have caused Elizabeth’s ovarian cancer. 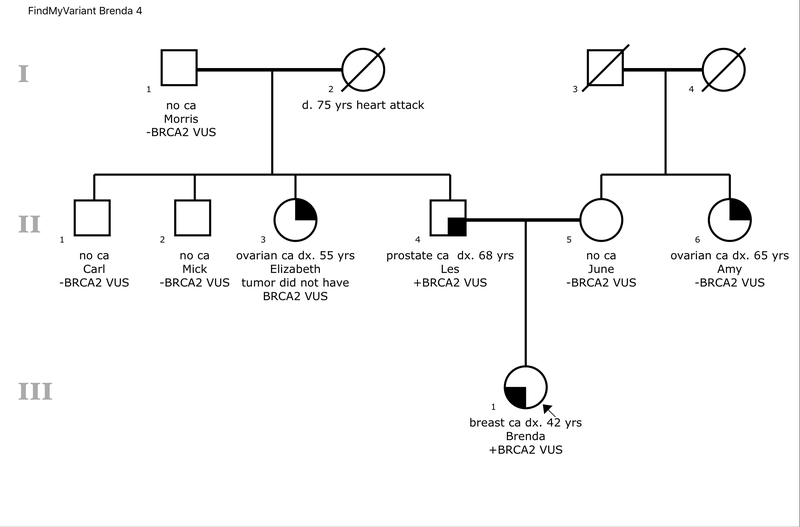 Brenda’s family information, combined with other information about the VUS, was enough to reclassify the BRCA2 VUS as likely benign.